61 Bowdoin Street, Boston, Saturday, 16 November 1861: Wrote as polite a note as I knew how to our neighbour Mrs. Weld this week au sujet de their end window on Beacon Hill [Place], which they have no right to keep open, and which they do, to my great inconvenience. I bore it all last winter without remonstrance – one hates to seem unaccommodating. They have closed the window. But Mr. Weld writes to Dr. G[ray] in answer to my note to Mrs. W. and denies our right to close up their window. Mr. Carter says we have the right, but I shall do nothing more in the matter. We are not going to get up a quarrel or a law suit – it must be left to mutual courtesy; c’est tout. Now this affair has disturbed my usual equanimity not a little. I bore no ill will toward my neighbors on account of their blinds, though I remonstrated against their keeping them permanently open, to my great inconvenience. I did so in the belief that we had a legal right to object – Mr. Carter says we have. Mr. Weld denied that right, and in answer to my note says, “if he hears nothing more from us on the subject, they shall take the liberty of opening the window whenever it suits them &c &c.” We concluded it was not worth making a difficulty about or having uncomfortable feeling – and not caring to bandy notes back & forth about the matter, he did hear nothing more, for we let the subject drop then and there. I have intended making my usual yearly call there since, but have been too hurried in important matters to find time – and lo! this explosion of wrath! with its angry allusion to the “blinds” hinting at least, as to whence it comes, very significantly. And yet one feels it almost an insult to accuse a lady, even in one’s own secret mind, of so unlady like and underbred an expression of spiteful feeling as this coarse, illy-expressed anonymous missive! Of course one can take no notice of it – not even to regret that one’s boys are such a nuisance to the neighbourhood – or to explain that we hold the parental relation and responsibility to only 4 out of the score or two of rampaging boys whose climbing fencing drumming &c proves so distressing to the neighbourhood of Beacon Hill. Dr. [Gray] suggests it may be a hoax – but to me it seems what children call, downright earnest! and though I am beginning to laugh at it now, it really wounded and vexed me not a little yesterday. We are peaceably disposed people and would prefer being on friendly terms all round – but our neighbors seem likely to make a feud of it, whether I will or no – for how can I make a call there after this?! 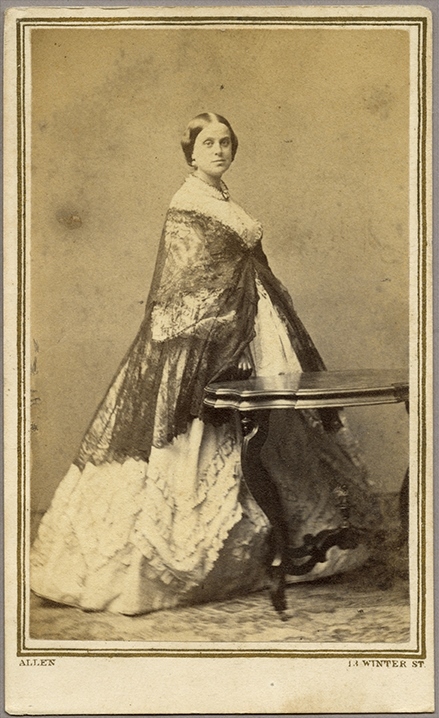 Isabella Melissa Walker (1813–1908) married William Fletcher Weld as his second wife in 1838. The diarist’s best friend, Rebecca Parker Wainwright (1820–1901). The Wainwrights lived at 14 Chestnut Street. Maria Trumbull Wainwright (1831–1905) married Theodore Bailey Bronson in 1851. This was the crux of the matter, since calls – made and returned – were the lingua franca of Mrs. Gray’s Boston. If she was not on visiting terms with the Welds, this would have ramifications in her other relationships, as both families had large social circles. Such a simmering feud would be awkward – and public. Fascinating insight into daily life…plus ca change. And ends with a cliffhanger–will she make that call or not? And why was it a problem to leave the blinds open? I chuckled at the boys–and sign myself “Another mother of boys”. Been there. I’m not sure, Virginia. I think perhaps that with the Welds’ blinds open the sun shone directly into the Grays’ house. It seems that there was a Beacon Hill Place cooperative of some kind, so that the actions of the Weld household could be constrained by objections from the Grays and the Carters — but I guess the specifics are lost to history! Yes, the concept of legal objection to one’s neighbor opening or closing their window coverings seems bizarre! I suppose the Grays could have closed their own or something; very curious! Reminds me of my mother being threatened with legal action by a neighbor if she didn’t move the wood pile which was on her own property (no covenants in this neighborhood, so it was a very odd demand). Like Virginia, I enjoyed getting a glimpse into the minutiae of daily life in the house (and hope to see more). Being unfamiliar with Boston, I couldn’t quite picture the layout of the houses, but certainly picked up the discomfort of having one’s quarters overlooked by a neighbor’s large window. There was a certain humor in the telling, but the discomfort of lack of privacy made me squirm a bit, having been in a similar situation! Ah, yes, the children. I grew up in a neighborhood that these days might be thought of as raising “free range” children, and it sounds very much the same. Rare these days and more’s the pity.